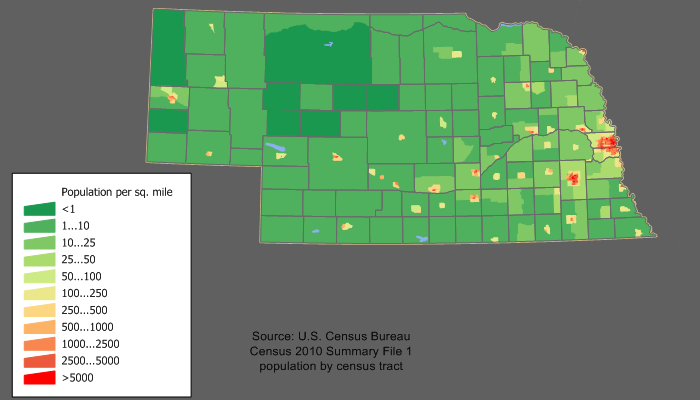 English: Nebraska state population density map based on Census 2010 data. See the data lineage for a process description. 2006-03-12 23:38 JimIrwin 640×450× (17676 bytes) [[Category:U.S. State Population Maps]] [[Category:Nebraska maps]] Nebraska state population density map based on Census 2000 data. See the [[User:JimIrwin/Lineage_of_population_maps|data lineage]] for a process description.